So that we fully understand the subject of this story, let me first explain to you the meaning of “Aam Pud Joh”. ‘Aam' is the name for the Chinese shrine in Phuketien language. ‘Pud-Joh' refers to Kuan Im (Chinese God). Therefore, we are talking about the shrine of Kuan Im. There are many shrines of Jao Mea Kuan Im in Phuket. 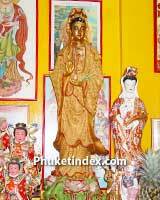 Phuketiens believe that she is the god of mercy and gratefulness. To attain prosperity in life, Phuketiens like to pay respect to her. Last year, I had a great chance to visit Aam Pud-Joh with my family on my birthday. But actually, I often come here because when I was a child, I was not healthy. My mother took me to pay respect to Kuan Im and offered me to be Kuan Im's daughter! Later in life I recovered quickly anytime I got sick, so on every special occasion or before taking a long trip, I always pray to Kuan Im. Finding the shrine is not difficult. From the main road in Phuket town, take Rassada Road to the water fountain circle and turn left onto Bangkok Road . The shrine is about 20m on the left. You will notice a red fence around the shrine and stupa-figured burner within the shrine area. Once getting inside, you will smell fragrant incense and hear a beautiful prayer song in Chinese language. Look around the shrine, you will see many images of other Chinese Gods such as Jao Mea Tub-Tim, Teppajao Kuan-Au, Tep Hok-Lok-Sew, etc. hanging on the walls. The most popular offerings are silver and gold papers, joss sticks, candles, tea and a variety of fruits (particularly those which have significant meaning). On one occasion I recall an old woman who assisted all visitors throughout the worship process here. But today I do not see her so I ask about her to the new assistant. It appears that she has passed away. It is said that selection of the new assistant must be approved by the prior assistant and Jao Mea (by casting lots). While paying homage to all Chinese gods, we should wait for one joss stick to be burnt out (to protect the shrine from fire). The next step is burning gold and silver papers. After the process is over, we take home some fruits for good luck. That is all for today. Wherever you may be, enjoy your day. Hardly to park and you should to park at the opposite side road.